The current versions of Porsche’s mid-engined sports car are sticking around for a long time. 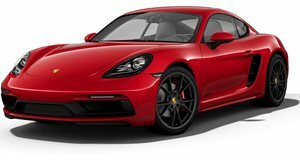 Traditionally, new versions of the Porsche 718 Cayman and Boxster arrive around a year after a new 911. This has been the case for the last two generations of Porsche’s entry-level sports cars, but the automaker won’t be continuing this tradition for the current series. Speaking to Road and Track, Porsche’s August Achleitner confirmed at the 2019 Geneva Motor Show that the current 982-generation 718 Boxster and Cayman will stick around for a very long time. "From today's point of view you most likely will see an end [for the 982] in 2023," he said. Achleitner blames the even stricter Euro 7 emissions regulations that will be applied soon, which will have a huge effect on sports car manufacturers. "The situation in Europe isn't really fun because there's a trend to change these requirements with dramatic speed, which does not fit at all to development times in the automotive industry," he explained. Consequently, this means Porsche needs to spend so much money on engineering its motors to meet these emissions requirements that it can’t invest in a new platform. This is even harder to justify when the Cayman and Boxster are relatively low-volume cars. In 2023, the current platform will be very old since the 982 is essentially a revision of the 981 Boxster/Cayman platform from 2012. Whether this platform will seem dated in four years from now remains to be seen, but today the current Cayman and Boxster are arguably the best mid-engine sports cars in their class. In the meantime, there are also plenty of special-edition versions to look forward to. The new Cayman GT4 and Boxster Spyder will launch this year with a flat-six engine, and the US is also getting the purist-pleasing 718 T models.